Statistics can be tricky things. Take the world of marketing: no matter how many times we read that content marketing has 62% lower costs than outbound marketing, or that "content marketing leaders" (whatever that means) generate 7.8x more traffic, there's still no guarantee that when we put virtual pen to virtual paper, we'll create something that actually works. Because while there are all manner of awe-inspiring statistics that speak to the efficacy of content marketing, they're all too vague and too generalised to be useful to anyone. Here at Cobloom, we develop content marketing strategies for SaaS companies. And while we've seen the power of content marketing first-hand, we've still yearned for irrefutable facts that look at the power of content marketing in the one industry we really care about: software-as-a-service. So fuelled by caffeine and naivety, we compiled a mega-spreadsheet of cold, hard, content marketing data. Taking inspiration from Process Street's pricing page study, we used the Montclare SaaS 250 as the basis of our analysis. Montclare's list is designed as an index of the world's most successful SaaS companies (in terms of revenue, funding, company size, growth, and a few propietary measures unique to Montclare) - giving us a directory of 250 of the world's biggest and best performing software-as-a-service companies. We then analysed every facet of content marketing, across every single one of the 250 companies, to understand exactly how content marketing works (or doesn't) in SaaS. We looked at the quantitative (using SEO toolkit Ahrefs) and the qualitative (using old-fashioned human power), analysing everything from the organic search traffic generated by top performing blog posts, to the types of calls-to-action used by each company. We then turned the raw data into actionable, SaaS-specific insights on blogging, backlink-building, content length, you name it - each designed to help you improve your own approach to content marketing. Was blogging part of the content marketing toolkit for enterprise SaaS companies? If yes, what was the purpose of these SaaS blogs? What types of content were being shared? What content management systems were the top SaaS companies using? This qualitative data gave us fantastic insight to how the world's biggest SaaS companies approached content marketing. Our results showed that 27 of the 250 world's biggest SaaS companies have no blog presence whatsoever. This surprised me - the closest parallel I could draw is talking to a group of 10 strangers at a bar, and finding out that one of them doesn't own a TV. After all, it's 2017, and like the humble television, content marketing is affordable, the benefits are well known, and everyone else is doing it. Even more surprising: many of those that have abstained from blog marketing are huge, household names - companies big enough to create market-leading content marketing with a click of their fingers and a tiny fraction of their marketing budget. Interesting though these outliers are, the real insights come from the vast majority of SaaS companies that have a defined content marketing strategy and an active blog - so let's turn our focus to them. 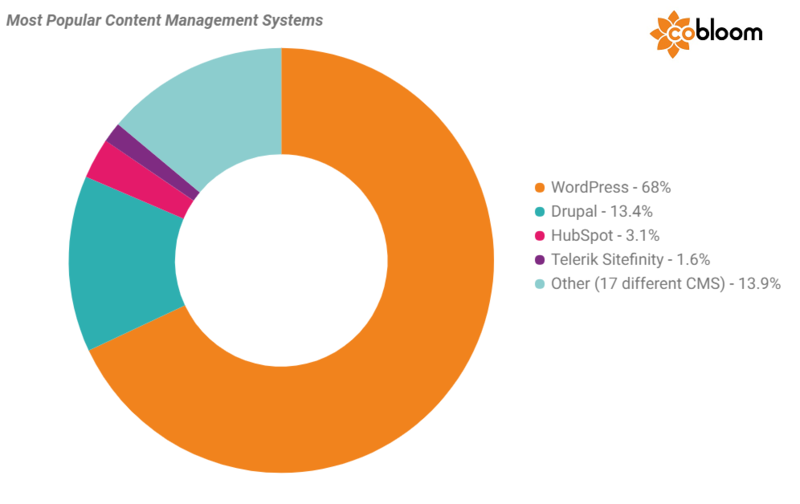 Across the 223 SaaS companies with blogs, we identified 20 different content management systems in use, but the most popular choice - by far - was WordPress, used by 132 (68%) of companies. Though this isn't surprising (WordPress is the world's most popular CMS), it's interesting to see a platform that many associate with SMBs thriving in the enterprise ecosystem. 68% of enterprise SaaS companies choose WordPress for their CMS. Given how strongly HubSpot's own blog performs compared to the rest of the Montclare SaaS 250 (more on that later), it was interesting to note that only 5 companies on the list are using HubSpot for their content management system. We suspect that if we analysed 250 of the fastest-growing SMBs that would look very different - testament to how they've focused their marketing towards small to medium businesses and startups. PR-style blogging about the company, its products, and product features. Educational blogging to share helpful, problem-solving content. A mix of the two, with the company sharing both PR and educational posts. Unsurprisingly, the 'mixed' approach to blogging was the most popular strategy, adopted by 45% of SaaS companies. It gives them the best of both worlds, with a platform for product and company updates alongside content aiming to help their customers benefit from their product. Interestingly, among those that specialised, the 'educational' approach to blogging edged out the PR-style, company-centric approach (accounting for 24% of blogs, versus 20%). This suggests that even among enterprise SaaS companies there is a gradual shift in how companies approach their content marketing, with an increased focus on their customers' needs rather than their company priorities. As well as analysing content marketing strategy across our entire data set of 250 SaaS companies, we also homed-in on the real high-flyers: the 25 SaaS companies with the highest levels of monthly organic traffic to their blogs. We found that these top SaaS companies were more likely to prioritise educational content than the rest of the list. 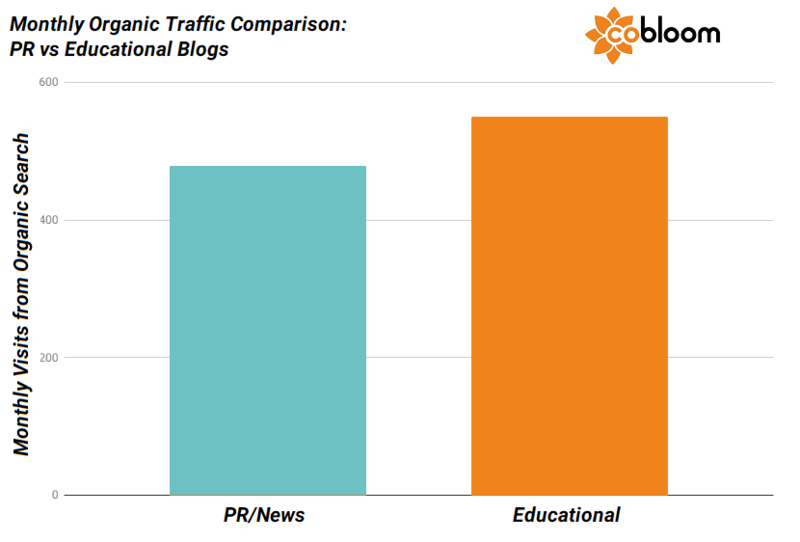 36% of the top 10% took an educational approach to blogging, compared with only 24% that focused on PR or company news - suggesting that educational posts are more effective than PR articles at driving organic traffic. On average, we found that blogs that took an educational approach to content creation received 14% more organic traffic than those which focused on company PR and news. Boost organic traffic to your blog by focusing on educating your readers, rather than selling or preaching to them. Given the large volumes of organic traffic at play (which we'll explore in a later section), this difference translates into thousands of extra blog visitors for companies that choose to educate, instead of share news. Given the phenomenal success of HubSpot, and their education-focused Inbound Marketing methodology, we weren't surprised that SaaS companies that follow in their footsteps benefited from significantly higher levels of organic traffic than those who are more company- or product-centric. How were companies generating value from their blog posts? What did blog posts look like? How important was design? Blog posts were structured in different ways, and looked very different from one company to the next. Some SaaS companies were clearly working hard to maximise the value of each and every blog post, while others seemed to lack a defined content strategy, and were simply blogging because they felt obligated. One of the smartest ways to gain value from your blog posts is to include a call to action, designed to convert your blog visitor from a one-time visitor to a subscriber or lead. This can be as simple as adding a blog subscription form to build-up an email list, or something more targeted and complex, such as inviting readers to register for a webinar. Blog posts had no calls to action. Readers could easily subscribe to the blog. Blog posts included calls to action designed to generate leads - linking through to a landing page where the user could share their contact details in return for a content asset such as an ebook or webinar sign-up. It was a fairly even split between the three approaches, but surprisingly having no calls to action was the most common tactic (36%). In comparison, 31% of blogs were aimed at building an email list (the primary call to action was for readers to subscribe to the blog), and 33% aimed to generate leads by offering the reader something of value in exchange for their contact details. This suggests that many companies - especially big, enterprise SaaS companies - fall into the trap of blogging because it's something they 'should be doing', and start doing so without spending any time developing a strategy to convert first-time blog visitors to returning visitors, subscribers or leads. 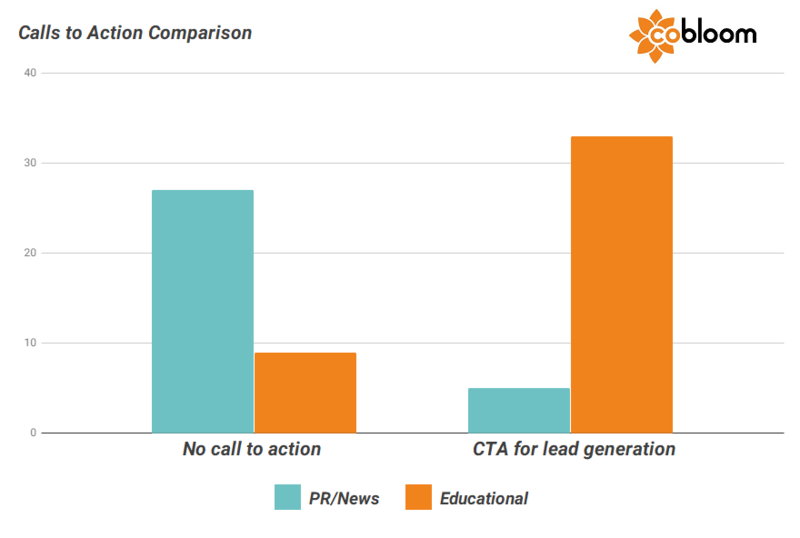 Interestingly, we discovered that companies with a PR-focused blog are three times as likely to have no calls to action compared with companies that take an educational approach to their blog (27 vs 9); while educational blogs are almost seven times as likely to focus on lead generation through calls to action compared with PR-driven posts (33 vs 5). This suggests that companies pursuing an educational blogging approach are likely to do so as part of a carefully considered content marketing strategy, rather than simply producing content for the sake of it. SaaS companies are taking a mixed approach to their use of images and visuals in their blogs: the majority (65%) use stock photos and images, which is surprising given the size of the companies we're looking at - you'd expect an enterprise SaaS company would have the in-house resources to design custom images for posts. In fact, only 17.4% of the companies we looked at used custom images on their blogs, while 16.6% used no images at all. Overwhelmingly, we found that blog posts are attributed to named authors - often with author photos alongside. 87% of companies have blog posts written by named individuals, whereas the remaining 13% take a more faceless approach, with posts either attributed to the company, or with no author attribution at all. Evidently, sharing a face and a name is a popular approach for humanising these large SaaS companies that could otherwise feel anonymous and unapproachable for prospective customers. As the saying goes: people do business with people. 18% of the biggest SaaS companies have their own podcast. Tangentially related to companies' approach to blogging, we noticed many companies had a podcast as well as a blog (18%). While this isn't a huge proportion, it's an interesting addition to their content marketing strategy, providing an extra platform for sharing content and positioning the companies as thought leaders in their space. Given the huge growth in podcasting in recent times (there are now more podcast listeners in the United States than there are Catholics), watch this space over the next few years. Once we’d looked at how the different companies approached blogging, and the various ways blogs were structured and used, we turned our attention to what was really important: how these blogs performed. This would give us insight into the efficacy of the top SaaS companies’ content marketing strategies. Number of referring domains the blog had. Organic search was the primary measure by which we assessed the efficacy of the top SaaS companies’ content marketing strategy. Are they creating useful content that addresses topics people are searching for – and is their content ranking in relevant search results? While the number of backlinks and referring domains a site has are closely linked, we looked at both separately, giving us more detail about where blog traffic was coming from. Were the top blogs receiving backlinks from a large number of referring domains (indicative of valuable blog posts that are regularly shared or cited as a resource), or were they only receiving backlinks from a handful of sources? 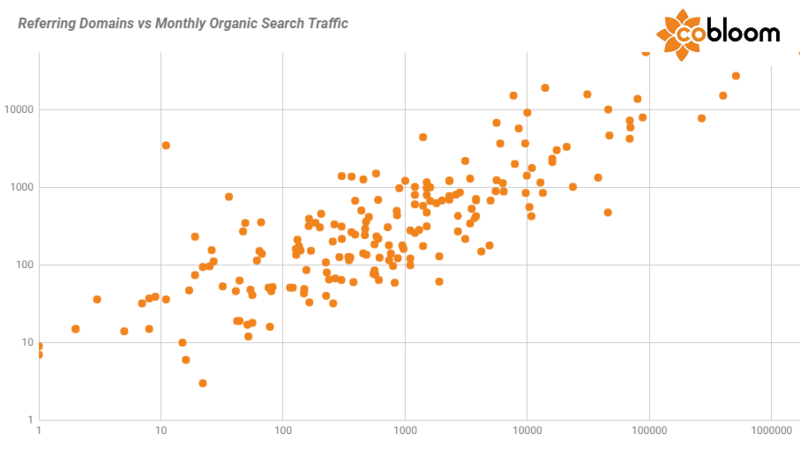 Across the 250 SaaS companies analysed, the median level of organic blog traffic was 573 visits per month. The top performing blog was HubSpot, receiving 1.8 million organic visits per month. This is an important statistic: for B2B SaaS companies, organic traffic can be a powerful (and predictable)source of qualified leads. For the sake of a few blog posts per month, the SaaS companies we surveyed were generating an average of almost 600 unique visitors, each and every month. With a half-decent conversion rate and Customer Lifetime Value (LTV), that quickly translates into a fantastic source of revenue (and ROI). However, averages don't tell the whole story. 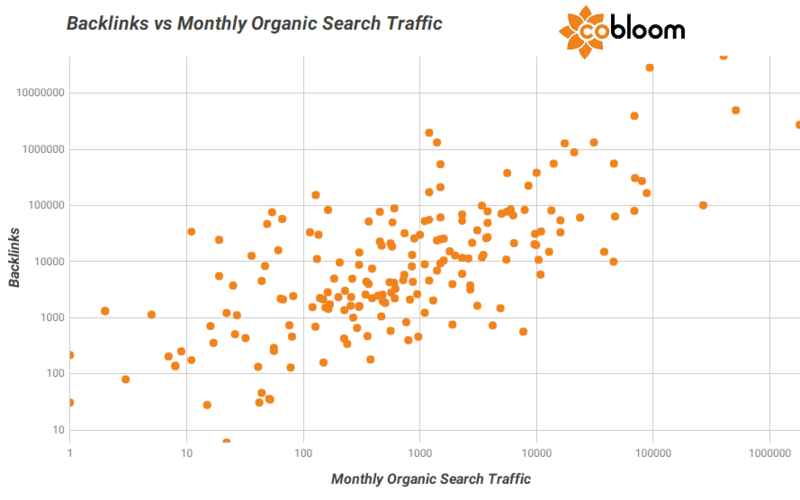 Though the median value was 573 visits per month, organic traffic was spread over a huge range, with dozens of SaaS companies lucky to net 10 organic blog visitors in a month, and a handful of blogs that could boast of monthly readership (from organic search alone) in the hundreds of thousands. 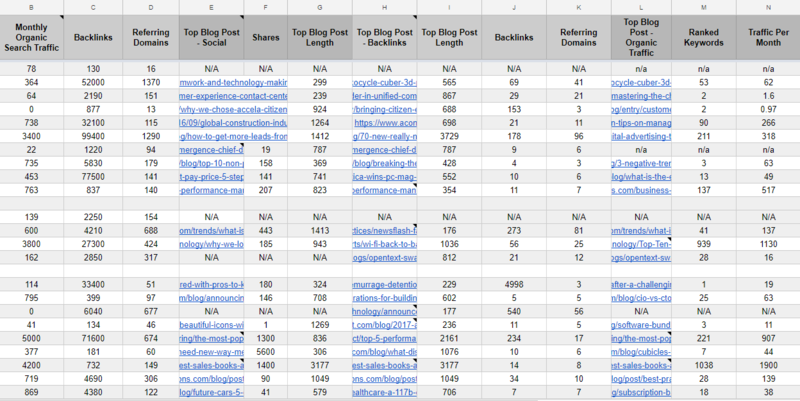 To illustrate this spread, we homed-in on the best (and worst) performing blogs. Across the top 10% of SaaS blogs we analysed, the average level of organic traffic was 45,700 visits per month - in stark contrast to the bottom 10%, receiving an average of just 7 visits per month. The top performing blog was HubSpot, receiving 1.8 million organic visits per month - more than three times the levels experienced by the blog that came second on our list (Google, with just over half a million visits), and more than 3,000x the average. Despite some differences in their approach to content marketing, most of the SaaS companies we analysed take a broadly similar tack: publishing industry-specific, 500-600 word blog posts, on a regular basis. 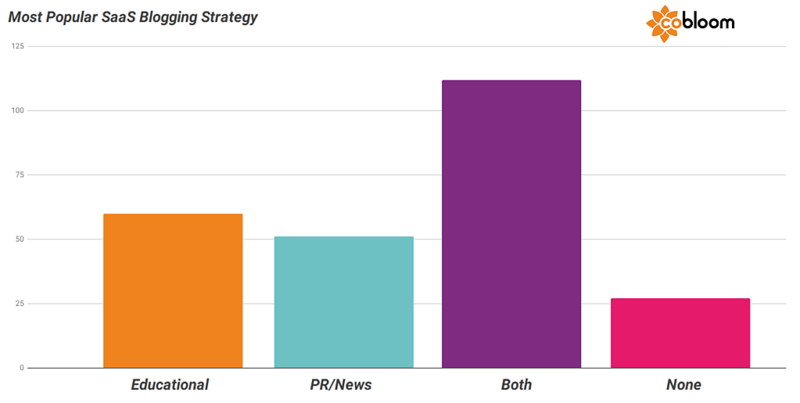 So how do we account for this huge variance in blogging efficacy? Backlinks and referring domains are two of a few sure-fire, guaranteed ranking factors that directly influence search engine results, so we turned our attentions to the backlink profiles of the 250 SaaS blogs surveyed. The average SaaS company from our data set has 6,055 backlinks to their blog, coming from 267 referring domains. Given the huge variance in organic search traffic we saw earlier, I expected to see a similar pattern in the distribution of backlinks and referring domains, and I wasn't disappointed. While the top 25 SaaS companies surveyed benefited from an average of 167,000 backlinks from 4,630 referring domains, the bottom 25 saw a meagre average of 217 backlinks from 15 referring domains. Unsurprisingly, the SaaS companies that top the organic traffic leaderboard also tend to have the most backlinks, and vice versa. There's obviously a chicken and egg scenario at work here: the more backlinks and referring domains your content has, the more likely it is to rank well and drive organic traffic; and the higher a post's organic traffic, the more likely it is to pick up backlinks and referring domains. While search traffic and referring domains have a strong positive correlation (r=0.72), search traffic and backlinks have a weak correlation (r=0.26) - so your blog would be best served by generating backlinks from as many websites as possible. In a world where blog posts, guides and opinion pieces are as common as stars in the night sky, the success of content marketing usually comes down to a handful of truly exceptional pieces of content - the shooting stars that seem to slip free from their orbit, and sail off to new, untouched frontiers. We then averaged these data sets to create clear, data-driven benchmarks that your SaaS company can use to gauge its own content marketing performance. For each criteria, we've reported on the average for the entire data set (all 250 companies), the Top 10% (the 25 best-performing companies) and the Bottom 10% (the 25 worst of the bunch) - creating a "high", "medium" and "low" benchmark. "Content is fire, and social media is gasoline." With over two and a half billion active users, social media sites are powerhouses of content promotion and lead generation in their own right - before we even consider the relationship between social media signals and search engine performance. When we analysed the top performing posts from each SaaS company, we found that the average "best-in-class" blog post was Liked, Tweeted or Shared 246 times. Glassdoor's round-up of America's highest paying jobs generated 18,000 social media shares. So if you're able to create a blog post that generates over 250 social shares (a very achievable benchmark: our epic guide to SaaS metrics had racked-up 475 shares at last count), you have a great indication that your social media game is better than average. If you want to set your sights even higher, there's then a huge jump up to the top 10% of companies analysed, with a median of 2,100 shares for their top post. Social media shares are all well and good, but as far as traffic sources go, it's difficult for SaaS companies to rely on. Traffic numbers can be hugely volatile, and prone to seasonal fluctuations; the success of posts is wildly unpredictable; and at the end of it all, there's no guarantee that any of those visitors from Instagram or Pinterest will actually buy something from you. So how do these posts compare in terms of more long-term, predictable traffic sources? How does content marketing in SaaS impact those most hallowed search engine signals, backlinks and referring domains? When we picked-out the best performing blog posts from each of the 250 SaaS companies analysed, we found the average best-in-class post was responsible for generating 38 backlinks from 17 referring domains. While that may not sound all that impressive, for most SaaS companies, that's enough to offer a significant improvement in search engine rankings, all from a single blog post. Instart Logic's popular infographic garnered a staggering 20,124 backlinks. However, that benefit is massively amplified by the real high-flyers, with the best performing blog posts generating a staggering average of 623 backlinks from 156 referring domains. Many of the best performing posts in this category were infographics, including Instart Logic's effort, which generated an insane 20,124 backlinks (albeit from... 12 domains). Winning the referring domain stakes was HubSpot's own take on content marketing, generating 5,514 links from 2,190 domains. 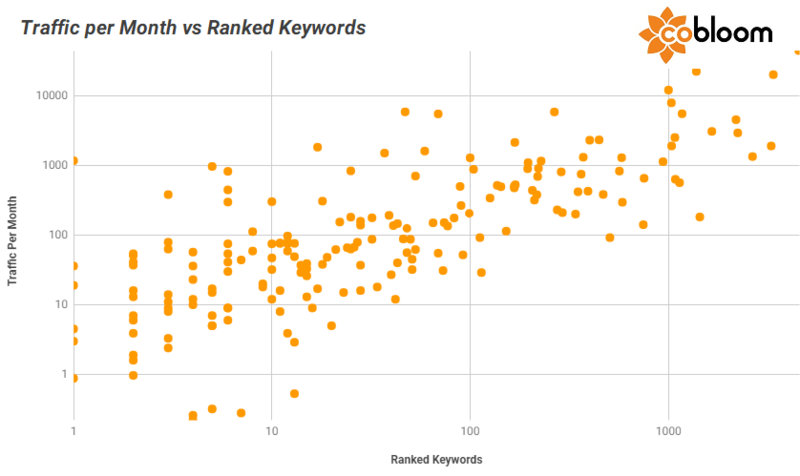 HubSpot's best blog post ranks for 4,547 keywords and generates 44,472 visits per month. When we talk about content marketing's great return on investment, it's the power of organic search traffic we have to thank. Content and inbound marketing are famous for the "J-shaped" curve, with visitors to blog content compounding, month-on-month, creating a predictable (and sustainable) source of visitors, leads and customers. But not all blog posts are created equal. For every runaway success, you might churn out a dozen middling posts, and it can sometimes be difficult to work out what a successful post actually looks like. 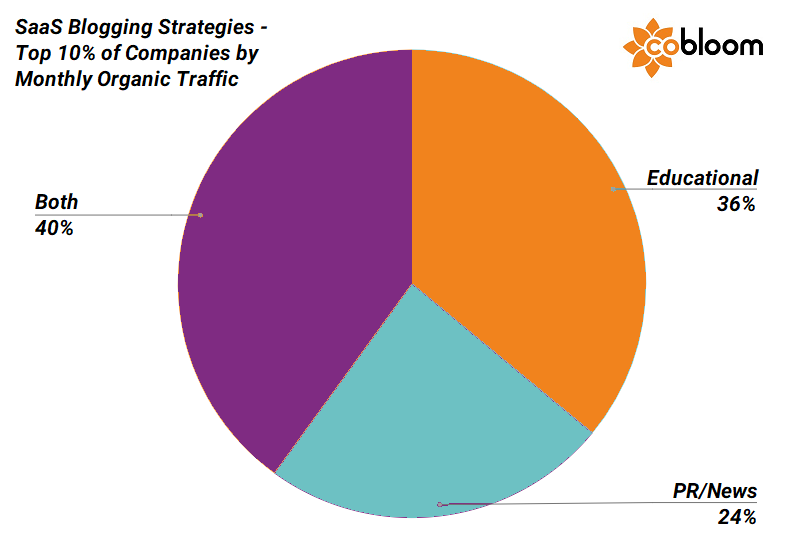 To help answer the question, we identified each company's best performing blog post, as measured by the organic search traffic it received each month. Over the entire data set, the average best-in-class post ranked for 25 keywords and generated 77 organic search visitors each month. Though this isn't huge, that's 77 visitors that can be relied on, each and every month, in addition to any that come from referral, direct traffic, social media or paid traffic. Better yet, most organic search visitors are more sales-qualified than those from other sources, being better educated about their problems, and more likely to take action to solve them. As before though, those figures pale into comparison with the top 10% of companies, with their best posts ranking for 401 keywords, and generating 2,514 monthly visitors from organic search (not bad for a single blog post). With so much emphasis placed on the relationship between word counts and search rankings, we were interested to see if our own data set revealed any trends - so for each segment of top performing content (social media, organic and backlinks), we also measured content length. The results were clear-cut: the best performing blog posts analysed were 11.9% longer than the average, and 20.2% longer than the worst performing posts. Though this is only correlatory, it seems to suggest that longer content is more likely to net social media shares, backlinks and organic traffic than shorter blog posts - in-line with popular opinion (and our own experiences). 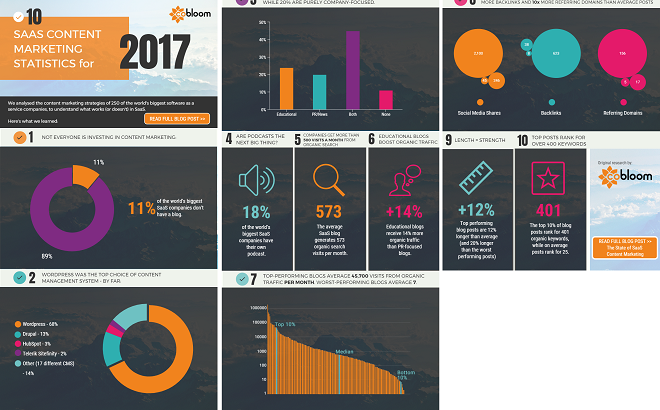 View infographic: 10 SaaS Content Marketing Statistics for 2017. To echo the opening section, statistics are only as useful as their ability to actually improve your marketing. So what can we learn from the data we've waded through? What does this mean for you, and your SaaS business? Almost all big, successful SaaS companies use content marketing. Most of them don't understand it, and don't execute it properly. Content marketing is a near-universal tactic amongst the SaaS companies featured here, and in some instances, their results are suitably impressive. But for every high-flying HubSpot, there are dozens of big, successful SaaS companies with atrocious content marketing. Case in point: here at Cobloom, our content marketing is overseen by a team of two, and yet our own marketing results put us into the top 50% of companies featured, companies with marketing budgets and dedicated teams hundreds of times larger than our own. And that's why I view this data as a call-to-arms. Our research into the state of content marketing has revealed a huge opportunity for smaller SaaS companies to disrupt their giant, bloated competitors. Better yet, the data reveals exactly how you can achieve that end. Fundamentally, these are all opportunities to take on the "big boys", and best their content marketing efforts with a fraction of the resources and budget. Most of the companies we analysed wrote blog posts as uninspired as they were unhelpful. Their content reeked of blogging for blogging's sake, and ticking off a requirement for the company's end of year report. Don't do that. If you're willing to spend time, energy and money on content marketing, create a plan of attack. Learn about your customers, their problems, and the value they get from your product. Bring data to bear on everything you do, analysing keywords, conversion rates, page engagement and more to create something that actually works. Most of the companies featured here weren't smart about content marketing - and it really shows. Content marketing in SaaS, like every other niche, requires time. They are ways to accelerate its benefits, but fundamentally, it's an exercise in patience and long-term results building. Every single high-performing blog I've ever come across achieved their success through consistency. When other companies grew frustrated and shut-up shop, they kept publishing great content on a regular basis. Many of the blogs we happened across were half-finished, with a handful of posts - so you have an opportunity to outperform them, by sheer virtue of consistency. Product launches and new features are important, but they don't create that same fuzzy feeling as content designed to educate, inspire and engage. If you want to use content marketing to generate sales for your business, offer something valuable in return: talk to your customers, solve their problems and built trust and empathy with your content. Average marketing performance is caused by, you guessed it, average marketing. Though "industry best practices" have their place, truly phenomenal content marketing comes from the experimental outliers that weren't afraid to try something new. With that in mind, try allocating, say, 1% of your marketing budget to experimentation. While the big-name SaaS companies are churning out run-of-the-mill, 400-word blog posts, you can take advantage of their risk-averseness, and implement novel strategies (like original research, or truly epic posts) to outperform them. As our research shows, content marketing has grown hugely in popularity over the last few years. Though there's a big opportunity for your company to disrupt its competitors with a well-applied content strategy, that opportunity has a time limit. Most of the SaaS companies featured here don't "get" content marketing - but in time, they will. If you strike now, you'll be able to unseat companies much bigger than you - but wait too long, and the moment will pass by. If there's one big takeaway from this data, it's probably this: there's never been a better time to harness the power of content marketing to grow your SaaS business.